AA6E Station Log: End of the world, coming into view? Solar cataclysm (for shortwave radio folks) is happening right now. 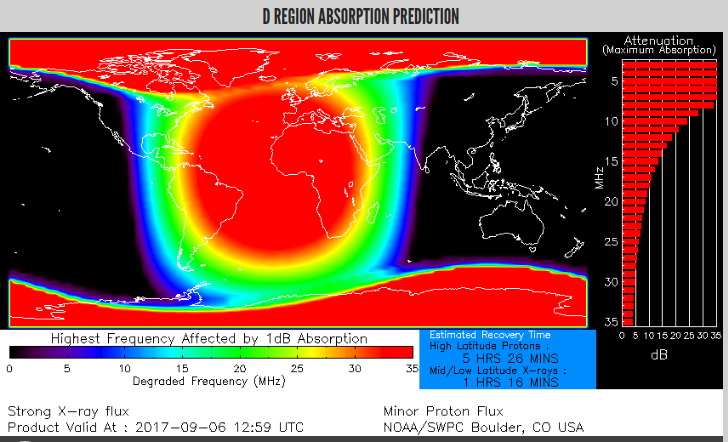 The red shows the absorption of radio waves around the globe, with the center in the current sub-solar point (where it is noon). In addition to this, we have a "CME" (coronal mass ejection) of high-speed charged particles generated by a previous flare event that is supposed to hit us today, causing a geomagnetic storm that should further screw up the HF airwaves. You probably won't lose your electric power, however, but you might get to see the aurora borealis tonight -- if it's not raining cats and dogs. And, there are big thunderstorms outside. And, there are two big hurricanes out there somewhere -- not in New England (yet) fortunately for us. And lots of trouble coming from DC and some other world capitals.